Sunday, 3/24, begins a 7 day “Immersion Event” into Experiencer Contact, UFO’s, Consciousness, Disclosure, Remote Viewing, Life after Death, Psychic Phenomenon, Historic UFO Cases, and other fringe topics. Our days begin with speaker presentations at 8:45am Sunday, 3/24. There will be 5-6 speakers per day, films and Special Events in the evenings; the week wraps up with a Banquet Dinner, Saturday, 3/30. UFO MEGA CON will offer several "Special Events" including: Wednesday 3/27 "Military Witnesses Interview" with film maker Robert Kiviat, Friday Night 3/29 "George Noory & Friends" which includes a Game Show: Who's Telling the TRUTH? and Saturday 3/30 Buffet Banquet interview by George Knapp of David O'Leary, the creator of the new TV show "Project Blue Book". There will be films: "Patient 17" by Jeremy Corbel; "The American Media and the 2nd Assassination of John F. Kennedy" by John Barbour; "The Nimitz Encounters" by Dave Beaty; "The Jim Nichols Story" by Jim Nichols; and "America's Fall From Space" by David Adair. A bound to be favorite activity at UFO MEGA CON will be the "Desert Sky Watch with Night Vision Googles" tours on 3/23, 3/26 and 3/28; skillfully lead by Melinda Leslie owner of UFOSightingTours.com in Sedona, Arizona. 1 Day Speakers Passes start at $69; 4 Day Packages start at $329; 7 Day Packages start at $499; Desert Night Vision Sky Watch $20; Intimate Experiencer Sessions $5. Packages include Meals and the Saturday Night Banquet (if purchased as part of Package). 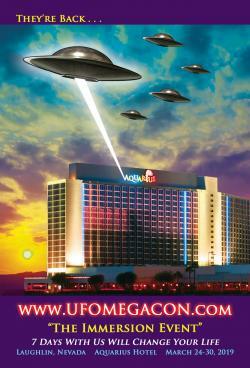 UFO MEGA CON, a presentation focused, UFO encounters, experiencer driven, educational conference. Purchase your tickets now - this first of its kind event will sell out soon! An event of significant importance in relation to the recent Pentagon “Disclosure” via release of documentation published in the New York Times, Washington Post and other publications in late December 2017, will be the Wednesday night, March 27, “Military Witnesses Interview” of Servicemen from the 2004 Navy exercises of the Nimitz and Princeton hosted by film maker Robert Kiviat. These “Military Witnesses” eyewitness accounts, fueled the now infamous “tic tac” footage media frenzy. And, even more important, is what happened to them after these encounters. UFO MEGA CON has invited “Project Blue Book” TV show creator, David O’Leary to be interviewed at the Saturday night banquet by Emmy Award winning Las Vegas TV Report, George Knapp. This is Mr. O’Leary’s first appearance at a UFO specific conference. David will be asked a myriad of questions, starting with why he chose to create a TV show based on “Project Blue Book” and the story of Dr. J. Allen Hynek. Sure to be an insightful interview into a significant chapter of classic UFO military history. Besides presentations by 40+ speakers spanning 7 days, join us for a fun and entertaining evening with “George Noory and Friends”, Friday, March 29. Coast to Coast AM’s George Noory will host a panel whose goal is to stump the audience by “fibbing - convincingly” for the “Who’s Telling the Truth Game.” After, George will join our musical entertainment, Robert Perala and Linda and Malcom Dane, will take us down memory lane where Sinatra, Elvis and others are honored in song. UFO MEGA CON is focused on the educational and scientific aspects of contact and UFOs, but will address the experiencer phenomenon as well, by offering “group sessions” for experiencers with a certified professional. A new standard of group sessions will be established at this year’s first UFO MEGA CON – Intimate Experiencer Groups. Instead of one hypnotherapist leading a group session with 200 or more experiencers - who have had a myriad of different types of contact - we will have 4 Therapists leading 4 groups at the same time; covering a variety of different and specific types of contact, different forms of communication, ways of interaction, and other important issues that arise from being an experiencer (contactee, abductee, etc.). These groups are limited in size as to give individualized attention to participants – resulting in better therapeutic interactions and results, than ever before. Another entertaining event being offered at UFO MEGA CON is the Desert Sky Watch with Night Vision Googles lead by Melinda Leslie and her wonderful “Sky Watch Ground Crew” of skilled Night Vision Goggle UFO sighting experts. Melinda will conduct tours Saturday night 3/23, as well as two “during conference” Sky Watches, Tuesday 3/26 and Thursday 3/28. For more information about Melinda and her UFO Sighting tours in Sedona, Arizona, please visit: http://www.UFOSightingTours.com. SPECIAL GUESTS INCLUDE: Geroge Noory, host of Coast to Coast AM; Tom Danheiser, Producer, Coast to Coast AM; George Knapp, Sunday Host Coast to Coast AM, and Emmy Award winning TV Journalist; David O’Leary, creator of “Project Blue Book” TV series on the History Channel; Robert Perala, experiencer, author and musician; Malcolm and Linda Dane, vocalists; with more to come. FILM MAKERS: Jeremy Corbel; John Barbour; Dave Beaty; Jim Nichols; and David Adair. MILITARY WITNESSES: Kevin Day; Patrick “PJ” Hughes; Gary Voorhis; with more coming forward every day. 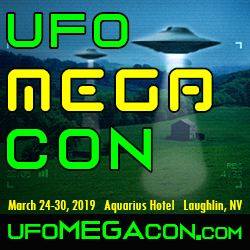 UFO MEGA CON PRESENTERS: Bill Ryan; Jeremy Korbe; Rudy Schild; Rey Hernandez; Mary Rodwell; Daniel Sheehan; Peter Robbins; David Adair; Richard Doty; Melinda Leslie; Janet Ossebaard; Jerry Wills; Douglas Caddy; Sean & Sarah Bartok; Cheryl Costa; Dan Brock; Johnny Enoch; Thomas Conwell; Peter Smith; Jo Ann Richards; Dr. Joe Burkes; Calvin Parker; Kevin Day; Bob Kiviat; Shehnaz Soni; Mike Murburg, Esq. ; Geraldine Orozco; Kate Thorvaldsen; Howard Batie; LA Marzulli; Samantha Mowat; Marisa Ryan; Marc D’Antonio; Kerry Trent; Frank Kimbler; George Knapp and more to be announced. LICENSED HYPNOTHERAPISTS: Miesha Johnston; Carol McCloud; Barbara Lamb, and from above, Mary Rodwell and Howard Batie. 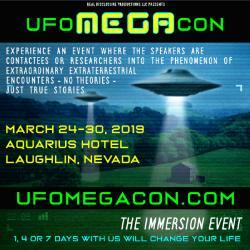 UFO MEGA CON ACTIVITIES: 40+ Speakers; Intimate Experiencer Groups; Special Guests including George Noory game show and vocal entertainment, George Knapp interview of David O’Leary, creator of the new TV show “Project Blue Book”; 2 Meet Your Speakers Dinners; 2 Keynote Banquet Speakers; 5 Films; Implant Scanning; Vendor Area; 3 evenings of Desert Sky Watch with Night Vision Goggles. WE HAVE PHOTO’S AND WEB BANNERS POSTED ON OUR WEB PAGE.